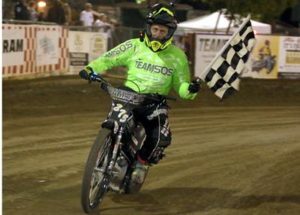 It was championship time at Fast Fridays Motorcycle Speedway last Friday night at the Gold Country Fairgrounds in Auburn. 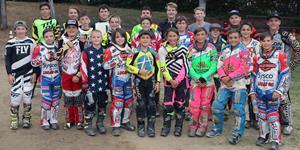 Sebastian Palmese and Travis Horn both won AMA Youth National Speedway championships in their respective divisions. 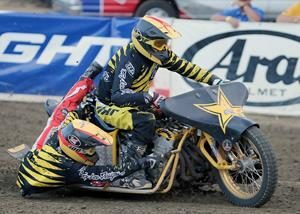 For the third year in a row Palmese, making the trip to Auburn from Southern California, proved to be the best 250cc youth rider in America with a perfect night. Palmese won all his heat races and had little trouble winning the championship with a perfect 15 point score, while making it look easy on the way. In a close second, Landon Norton of Citrus Heights was second in the championship format with a score of 14 points dropping just one point to Palmese when they met in heat four. Auburn’s Kyle Cunningham was third with 12 points. In all 16 youth riders and one reserve rider participated in the exciting program. 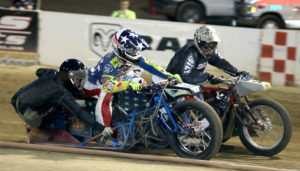 They rode in 20 heat races each rider facing each other at least once scoring points for each finish position. Three points for a win, two points for a second place finish, one point for a third place finish and no points for a fourth place finish. 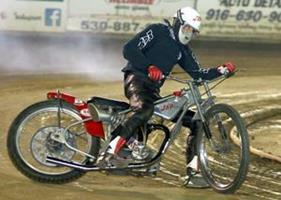 The rider with the most points after 20 heats was crowned the champion. The racing was all scratch starts, with riders starting even on the start line. Palmese was unmatched as the fourteen year old raced like a seasoned pro. 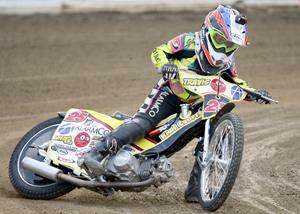 Palmese had just returned from Europe racing in the FIM Youth 250cc World Championship. “I was trying to go fast, as fast as I could, I’m really excited, I gave it all I had,” said Palmese. “I hope to ride a 500cc bike next year, I think this will be my last year on a 250cc bike,” he said. 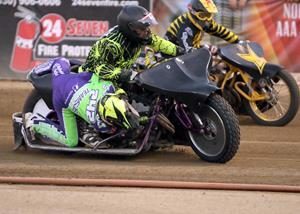 In the 2018 AMA Youth National 150cc championship it was Travis Horn who was in the driver’s seat also winning his championship with a perfect score. 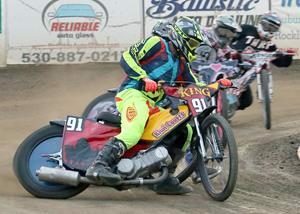 The 150cc’s raced in three heat races with the same scoring as the 250cc’s. The top three riders in points went straight to the championship race and the next four went to a Last Chance round. The winner of that race transferred to the championship round filling the last spot. The winner of the final race was crowned champion regardless of the score. Horn, also from Southern California, has been making the trip north for the last four weeks becoming very familiar with the tricky Fast Friday’s track. The extra work paid off for the ten year old speed demon as he needed to made room in the car for a very large trophy. Charlie Trana was second and Nick Hohlbein was third. All of these young riders deserve a big pat on the back they may be all under 16 years of age but they rode like champions, all of them, leaving it all out on the track. Along with a very ambitious championship program, Fast Fridays also ran a complete regular racing program. 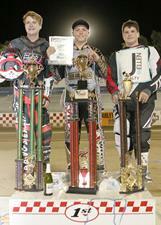 Billy Janniro proved to be the fastest man of the night winning the scratch main event. That puts eight notches on Janniro’s belt so far this year. 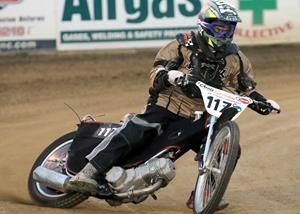 He and Bart Bast are the only riders to win the scratch main event this year. In this week ten, Bast has won the other three. Russell Green was second, Bart Bast was third and Ryan Bast fourth. Blake Borello racked up his third handicap main event win of the season. Borello, off the thirty yard line was able to keep ahead of Bart Bast and Daniel Faria to pick up the win. Bast, who finished second, is handicapped on the 50 yard line and Faria who starts on the 40 yard line finished third. Looks like Borello will be joining Faria on the 40 yard line next week as the win will most likely move him back 10 yards. Matt King found his way to the winner’s podium for the first time this season in Division II. King stayed ahead of Jamison Dilkey who was second and Fred Cook who finished third. Division III was a dogfight marred with two restarts. Dakota VanderBroeder took two hard falls but each time was able to get up for the restart. Tim Dion was out front for the entire race and was the first one in line for the restarts holding his position for a well deserved first place finish in marathon main event. It was Dion’s first main event win of the season also. Peter Pecorilla made a quick run for the finish line to catch Dion but fell a little short finishing second. Jake Estes was third. On Friday July 20 one of the longest running grudge matches in speedway history renews at Fast Fridays as the annual, popular North vs. South challenge resumes. 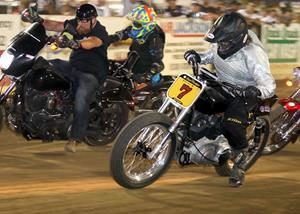 This will be the 27th meeting of this historic race between the best Northern California and Southern California speedway riders. Be sure not to miss team speedway racing at its best. Winners from the Youth 150cc division on the winner’s podium, (left-right) Charlie Trana (second place), Travis Horn (first place champion) and Nick Hohlbein (third place). Youth 250cc winners on the Fast Friday’s podium (left-right) Landon Norton (second place), Sebastian Palmese (first place champion) and Kyle Cunningham (third place). Matt King won his first main event of the season in Division II. 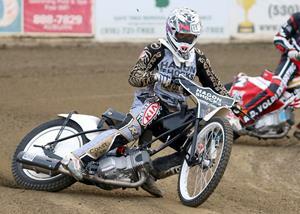 Sebastian Palmese rode to a third AMA 250cc Youth National Championship Friday night. Tim Dion won the Division III main event. His first main event win of the season. 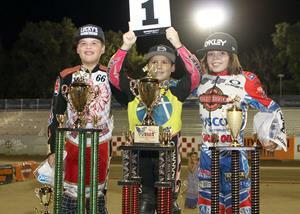 Travis Horn won the AMA 150cc Youth National Championship. Twenty-four youth riders qualified for the 2018 AMA Youth National Championship. Sebastian Palmese won the 250cc division and Travis Horn won the 150cc division.